Simplify running your business, increase customer satisfaction, track sales/expenses and reduce costs such as phone bills. Initial friendly consultation is always free, easy and no obligation. 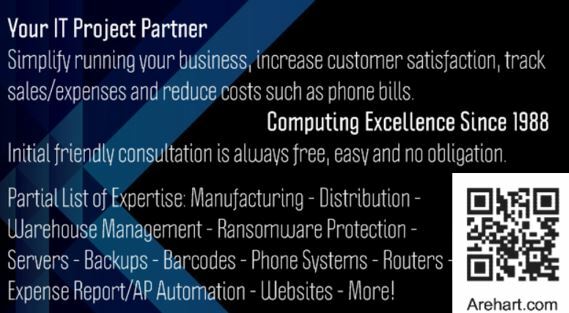 Partial List of Expertise: Manufacturing - Distribution - Warehouse Management - Ransomware Protection - Servers- Backups - Barcodes - Phone Systems - Routers - Expense Report/AP Automation – Websites - More! 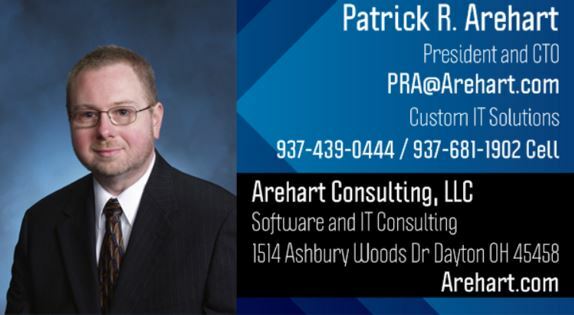 Click to view a PDF describing what Arehart Consulting, LLC can do for you. Did you know you can have your own personal Digital Business Card? Email or call Patrick at 937-439-0444 today!